Some historians believe it was originally developed by African slaves who escaped into the wilds of Jamaica when the British captured the island from Spain in 1655. Adapting to their new surroundings, the former slaves made use of the natural food sources available to them, creating the spicy sauce and slowly cooking the meat over a smoking wood fire. Other historians argue the case for the practice of jerking originating with the Amerindians in Jamaica from the Arawak and Taino tribes who intermingled with the Maroons. The smoky taste of the meat is achieved using various alternative cooking methods, including the use of modern wood burning ovens. The meat is normally, but not limited to, chicken or pork, and the main ingredients of the spicy jerk marinade sauce are allspice[a] and Scotch bonnet peppers. Jerk cooking is popular in Caribbean/West Indian communities throughout North America and Western Europe. Jerk is also derived from the action of “jerking”, which referred to poking meat with holes so that flavor could more easily be absorbed. The term jerk spice (also commonly known as Jamaican jerk spice) refers to a spice rub. The word jerk refers to the spice rub, wet marinade, and to the particular cooking technique. Jerk cooking has developed a following in the United States, Canadian and Western European cosmopolitan urban centres with Caribbean/West Indian communities. One story is that Jamaican jerk sauce developed as an adaptation by escaped enslaved Coromantee Africans in Jamaica. However, historians have unearthed evidence to show that all racial groups in Jamaica jerked meat in the seventeenth century, and the evidence appears to suggest that the practice started with the Tainos. When the British invaded Jamaica in 1655 the Spanish colonists fled, leaving behind a large number of African slaves. Rather than be re-enslaved by the British, they escaped into Jamaica’s mountainous regions where they mixed in with the local Taínos. It appears that these runaway slaves, who became the island’s first Jamaican Maroons, learnt this practice from the Tainos. It is speculated that while the Tainos developed the style of cooking and seasoning, the escaped African slaves introduced the marinade and the cooking pits. While all racial groups hunted the wild hog in the Jamaican interior, and used the practice of jerking to cook it in the seventeenth century, by the end of the eighteenth century most groups had switched to imported pork products. Only the Maroons continued the practice of hunting wild hogs and jerking the pork. From the start, the Maroons found themselves in new surroundings on the island of Jamaica and were forced to use what was available to them. As a result, they adapted to their surroundings and used herbs and spices available to them on the island such as Scotch bonnet pepper, which is largely responsible for the heat found in Caribbean jerks. Jerk cooking and seasoning has followed the Caribbean diaspora all over the world, and forms of jerk can now be found at restaurants almost anywhere a significant population of Caribbean descent exists, such as the United Kingdom, Canada, or the United States. 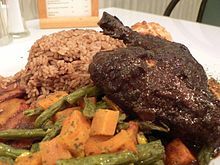 French Caribbean‘s poulet boucané (‘smoked chicken’) is quite similar to traditional Jamaican jerk chicken. The cooking technique of jerking, as well as the results it produces, has evolved over time from using pit fires to old oil barrel halves as the container of choice. Around the 1960s, Caribbean entrepreneurs seeking to recreate the smoked pit flavor in an easier, more portable method came up with a solution to cut oil barrels lengthwise and attach hinges, drilling several ventilation holes for the smoke. These barrels are fired with charcoal, which enhances the spicy, smoky taste. Alternatively, when these cooking methods are unavailable, other methods of meat smoking, including wood burning ovens, can be used to jerk meat. However, oil barrels are arguably one of the most popular cooking methods for making jerk in Jamaica. Most jerk in Jamaica is no longer cooked in the traditional method and is grilled over hardwood charcoal in a steel drum “jerk pan”. Street-side “jerk stands” or “jerk centres” are frequently found in Jamaica and the nearby Cayman Islands, as well as throughout the Caribbean diaspora and beyond. Jerked meat, usually chicken or pork, can be purchased along with hard dough bread, deep fried cassava bammy (flatbread, usually with fish), Jamaican fried dumplings (known as “Johnnycake” or “journey cakes”), and festival, a variation of sweet flavored fried dumplings made with sugar and served as a side. Jerk seasoning principally relies upon two items: allspice[a] and Scotch bonnet peppers. Other ingredients may include cloves, cinnamon, scallions, nutmeg, thyme, garlic, brown sugar, ginger, and salt. ^ a b c Allspice is a particular species of the flowering shrub pimenta, native to the Caribbean. The Jamaican name for allspice is “pimento”, due to conflation of the words pimenta and pimento. It is also called myrtle pepper. ^ Nichols, Patrick John (2015). ““Free Negroes” – The Development of Early English Jamaica and the Birth of Jamaican Maroon Consciousness, 1655–1670″. History Theses (degree thesis). ^ a b Oliver, Rochelle (20 July 2018). “Jerk, Authentically Jamaican and Unapologetically Hot”. The New York Times. Retrieved 21 July 2018. ^ a b “The History of Jamaican Jerk”. kitchenproject.com. Retrieved 21 May 2015. ^ a b “Jerk, Charqui and the Wonders of Walkerswood”. Jamaica Observer. 12 February 2015. Archived from the original on 3 August 2015. Retrieved 30 May 2016. ^ “The History of Jamaican Jerk”. ^ “Jerk History ~ from the Brithplace of Jerk for Sale | Boston Jerk Center Restaurants near Port Antionio Portland, Jamaica”. ^ a b Cloake, Felicity (11 July 2012). “How to cook perfect jerk chicken”. The Guardian. Archived from the original on 14 January 2016. Retrieved 31 May 2016. ^ “The Africans”. National Library of Jamaica. Archived from the original on 4 January 2013. Retrieved 31 May 2016. ^ Bray, Matt (29 June 2013). “Scotch Bonnet Pepper: The Caribbean Chili of Choice”. Pepperscale.com. Archived from the original on 16 March 2016. Retrieved 30 May 2016. ^ Glennie, Alex; Chappell, Laura (16 June 2010). “Jamaica: From Diverse Beginning to Diaspora in the Developed World”. MigrationPolicy.org. Migration Policy Institute. Archived from the original on 20 April 2016. Retrieved 31 May 2016. ^ “Cuisine de la Martinique et Guadeloupe”. Jamaica Observer. 29 May 2008. Archived from the original on 30 May 2016. Retrieved 31 May 2016. ^ a b “Jamaican Jerk Chicken”. Sunny Tours Jamaica. 20 October 2014. Archived from the original on 20 August 2015. Retrieved 31 May 2016. ^ “Ready to Eat”. Skies. Cayman Airways. 1 January 2016. Archived from the original on 3 January 2016. Retrieved 31 May 2016. ^ “Jamaican Festival Recipe”. Jamaica No Problem. Archived from the original on 7 September 2015. Retrieved 31 May 2016. Connelly, Michael Alan (December 18, 2014). “20 Must-Try Street Foods Around the World”. Fodor’s. Retrieved July 24, 2016.